Open a portal to another dimension and battle your foes to become the ruler of all existence! They are known as Drifters, individuals who can travel from one plane of existence to another. Some see them as saviors and others as heralds of doom. Wherever they appear, change is certain to follow. From out of nothingness, these Drifters create fantastic creatures of legend and bend the very fabric of reality to their Will. For theirs is the power of creation and destruction, and they eternally battle each other for dominance over all. Exodus, by Existence Games, is a trading card game. 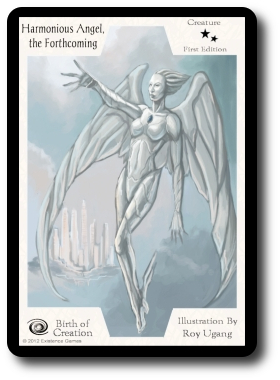 At the time of this review, the game is only available in the form of two preconstructed ready-to-play decks (Harmonized Skyborn and Harmonized Dragonis). 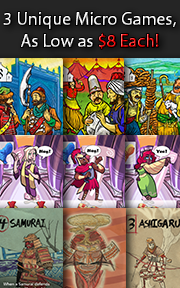 Each deck is comprised of 41 cards and each has a different theme (angelic warriors versus dragons). 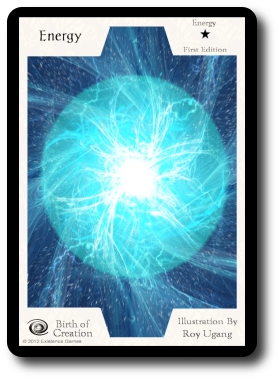 Twenty of the cards are Energy cards, the universal source of power and the most abundant resource available to the players. The other twenty cards are a mix of Creature and Symmetry cards. Creatures are the warriors the players will summon forth through the cards (which act like portals) that will battle for and defend the player. The Symmetry cards act like spells and change the base rules of the game temporarily, often giving the player a small advantage over their opponent. One card in the deck is a quick player reference card. Not included with any of the decks, but necessary to play, are 10 counters per player or a pen and a piece of paper to keep track of the player’s current Life Points. Also not included in the game is the rule book that must be downloaded from the game’s web site. Note that the two preconstructed decks are essentially the same except for 3 Symmetry cards in each deck. The Creatures are also different in each deck, but Creatures do not have any special effects or powers to make them unique. The game has a very small number of terms to describe its game play. For Gamer Geeks and any geek who has played card games before, these terms will not be new. They are defined here. Life Points (also referred to as Life Count or Life Total in the game) represent the player’s “strength”. As long as the player has at least 1 Life Point, they can keep playing the game. Once their Life Points drop to zero or less, they are out of the game. Energy represents creation and destruction in its rawest form. It is what brings things to life and causes them to die. The players have access to this energy in the game and use it to bring forth legendary creatures and cast powerful spells. Symmetry (also referred to as Symmetrics in the game) are special effect cards. Think of them as spells of great power. These cards are rule breakers, but their overall impact is slight and their bonuses fleeting. Decks (of which there are three in the game) are piles of cards. The players will have 2 to 3 decks at any particular time in the game. These are the Energy, the Main, and the Graveyard decks. Creatures are the warriors in the game that engage in battle for the players. They must be activated by the player to attack, but automatically defend the player from aggressive opponents and their minions. Turn is the term used to measure the time it takes for a player to complete their actions. Phase (also referred to as Steps in the game) is the term used to identify the different sequential actions a player can take during their turn. Match (also referred to as a Round in the game) is the term used to identify a single game. Note: It is assumed that the players are using the preconstructed decks for the game set up. We discuss the rules of deck customization later in the review, but the general set up is the same. Additionally, each player must have their own deck to play the game. First, have all the player’s sit around a central area, making sure that all the players have enough room to the left, right, and in front of them to play cards. Second, give each player 10 counters to be used as Life Points or have each player use a pen or pencil and a piece of paper to keep track of their current Life Point total. We strongly suggest you use counters of some kind. Third, have each player look through their deck and separate it into two piles. The first pile will be all the player’s Energy cards and the second pile will be all the player’s Creature and Symmetry cards. Forth, place the Energy pile to the left of the player. This is the player’s Energy deck. The rules suggest that the players put their Energy deck face-down, but we suggest you leave it face-up. Energy is abundant in the game and there is no advantage or disadvantage to knowing how much a player has, as energy always returns to the Energy deck when not in use. Essentially, it is a limitless resources. By keeping the Energy deck face-up, it is easier for players to quickly recognize one deck of cards from another. Fifth, take the pile that contains the player’s Creatures and Symmetry cards and shuffle thoroughly. This pile is placed next to the Energy deck, face-down, and is the player’s Main deck. Leave space above the Main deck for the Graveyard deck. Sixth, each player draws 3 cards from the Energy deck and 3 cards from the Main deck to create their initial hand. That’s it for game set up. Determine who the first player is and let the battle for inter-dimensional supremacy begin! The game is played in turns, with each player getting a turn as long as they have at least 1 Life Point. When their tun is over, the next player going clockwise has their turn. This continues until the Match is over. A player’s turn is comprised of 5 sequential phases that are summarized here. Note that a Symmetry card can be played at any time, during any phase, and on any player’s turn. Symmetry cards are played anywhere on the field, face-up, and the effects are activated immediately. Once the Symmetry card is resolved, it is discarded and moved to the Graveyard deck. The first thing a player will do on their turn is draw 3 cards from their Energy deck and 3 cards from their Main deck, adding them to their hand. If this is the player’s first turn, they will skip this phase. If the player doesn’t have any cards in their Main deck or not enough to draw 3 cards during this phase, the player takes their Graveyard deck, shuffles it, and places it face-down to create a new Main deck. There is no hand size limit in the game and the players are welcome to collect as many cards as they like. During this phase, the player places as many Energy cards as they like from their hand onto the playing area in front of them. Energy cards played to the table are organized into Energy piles. An Energy pile must contain no less than 1 Energy card and no more than 3 Energy cards. If an Energy pile is already in play and does not have a Creature attached to it, the player can play additional Energy cards to it as long as the total number of Energy cards in the pile does not exceed “3”. There is no limit to the number of Energy piles that can be in play and a player is never required to play any Energy cards during this phase if they do not want to. During this phase, the player attaches Creatures to the Energy piles played to the table. Only one Creature card can be attached to an Energy pile at a time. By default, all Creatures have zero strength and cannot attack or defend. It is only through the process of summoning them forth that the Creature is given strength. A Creature’s attack and defense strength is equal to the number of Energy cards it is placed on. 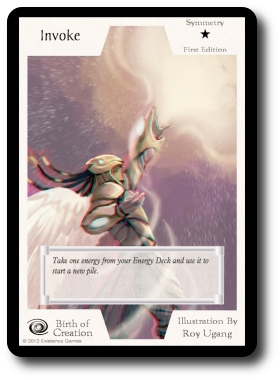 Recall that an Energy pile cannot contain less than “1” or more than “3” Energy cards when played during the Energy Phase and no additional Energy cards can be played to an Energy pile if a Creature card is attached to it. It is only through the use of Symmetry cards that the player can increase the number of Energy cards attached to a Creature card. Just like the Energy Phase, the player can play as many or as little Creature cards as they like, but each Creature card must be attached to an Energy pile to be brought out onto the table. During this phase, the player commands their Creatures they have played to the table to attack. By default, the Creatures will always attack and do damage to an opponent’s Life Points. The number of Life Points reduced is equal to the total number of Energy cards in the Creature’s Energy pile. For example, a Creature attached to an Energy pile of “3” will reduce an opponent’s Life Points by “3”. A player can direct their Creatures to attack any opponent they like, but each Creature can only attack once per turn. If an opponent has a Creature card on the table in front of them, this Creature defends and blocks all attacks from other Creature cards. As long as the opponent has a Creature card in play, their Life Points cannot be targeted by a Creature attack. Instead, the Creatures do battle. This is done exactly like a battle directed against an opponent, but the Creatures deal and take damage. When two Creatures face each other, their total Energy is counted and that amount is subtracted from the target Creature’s Energy pile. If the total Energy subtracted from the Creature’s Energy pile would reduce their Energy to zero or less, the Creature is sent to the Graveyard deck, face-up, and any Energy cards attached to it are returned to the Energy deck. All attacks happen simultaneously, so it is perfectly possible for 2 Creatures to destroy each other, forcing each player to send their Creature to the Graveyard deck. For example, if Creature “A” with an Energy pile count of “3” attacks Creature “B” with an Energy pile count of “2”, Creature “B” would be sent to the Graveyard and Creature “A” would only have 1 Energy card in its pile left. More than one Creature can attack the same Creature during the player’s turn, but each attack should be completed separately before another one is initiated. Additionally, if this is the player’s first turn, they cannot attack an opponent or their Creatures. During this phase, the player takes a moment to quickly organize their playing area by straightening up their decks and arranging their Creature cards to make it clear how much Energy each one has to make it easier for their opponents to see what is in play. This concludes the player’s turn and it is now the next player’s turn going clockwise. The Match comes to an end when only one player is left with Life Points. In a 2-player game, the Match ends as soon as one of the two players loses all their Life Points. In a 3 or more player game, game play continues until only one player remains with Life Points. 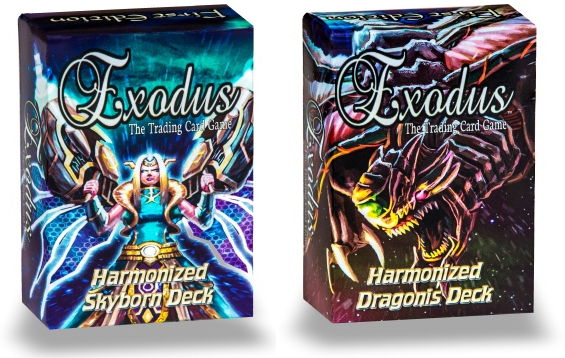 Exodus is customizable and players can create their own decks to play with. There are a few guidelines that dictate how a deck is built. And that’s it. A player could purchase several preconstructed decks or purchase future boosters and expansions to give their deck a personal touch. Or players can trade cards with each other to get new cards to use and get rid of old cards they do not care for. On each Symmetry and Creature card are a number of stars that identifies the card’s rarity. Useful for those looking to collect a complete set and determine the card’s subjective trading value. In the standard game, each player starts with 10 Life Points. We allowed our younger Child Geeks to have 20 Life Points until they demonstrated a certain degree of proficiency playing the game. By giving a player more Life Points, you lengthen their ability to stay in and play the game. As previously mentioned, we decided to keep the Energy deck face-up to make it quick and easy to know which decks were which. The game rules suggest the Energy and Main deck both be face-down. We suggest you keep the Energy cards face-up for younger Child Geeks until they get the hang of the game. It serves as an excellent visual reminder during their turn and has no negative impact to the game play. To learn more about Exodus, read the full rules, and see a game play example video, visit the game’s web site. Exodus is, by far, the easiest trading card game I have ever come across. None of the Creatures have special powers, the Symmetry cards are very straight forward and the resource that powers everything is unlimited. Additionally, there is no chance of a player ever running out of cards as everything gets recycled. 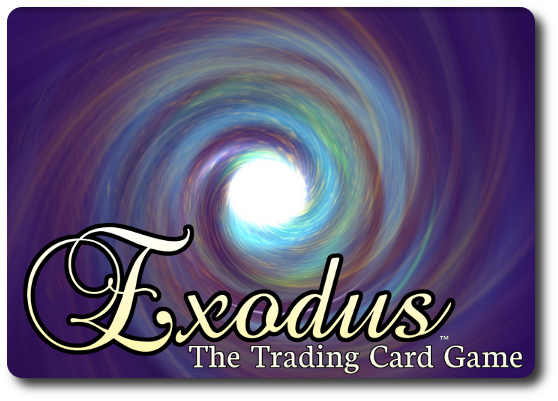 Most trading card games penalize the player when they run out of cards, but not Exodus. When a player runs out of cards, it’s an opportunity to get used cards back into play. This is going to be an exceedingly easy game to teach to both Child, Parent, and Gamer Geeks. This is especially true when we consider that I’ll be playing Exodus with Child, Parent, and Gamer geeks who are familiar with Magic: The Gathering, Yu-Gi-Oh, Pokémon, and your choice of any Fantasy Flight Living Card Game currently available, all of which have much more challenging game play and rules. I will, of course, find Child and Parent Geeks who are not familiar with games like Exodus, but there is little chance of me putting this game down in front of a Gamer Geek and surprising them. Exodus is simply not that cutting edge. Teaching the game is best done with an example turn. I simply introduced the three cards (Energy, Creature, and Symmetry), explained how they worked together, and then went through an entire turn. Very simple and none of the players except the two that were not familiar with games like Exodus had any questions. The few questions that did arise were mostly focused on the game rule specifics like timing and how many cards could be played at a time. And so, as I watched my oldest little geek shuffle his cards and draw his starting hand, I asked him what his thoughts on Exodus were so far. True. It most certainly doesn’t. Knowing what Creature card he has is useless information as all Creature cards are the same. The only thing that differentiates them is the amount of Energy they have attached to it. Let’s see if Exodus is worth the journey or it was a trip we never should have taken. For the Child Geeks who were familiar with games like Exodus and those who had never played games like it before, that game was a smashing success. They loved it. Absolutely loved it. What did they like? It would be easier to list what they didn’t like, actually. The Child Geeks only disliked two things. First, they didn’t like the fact that they couldn’t bring forth overpowered Creatures (an intentional game design) and they didn’t care for the fact that there weren’t more cards to play with (limits based off what cards I had access to). So, really, not much to be all that upset about. Everything else they greatly enjoyed. The game play, the quickness of turns, and the nonstop action. Draw cards, summon forth an army of legendary Creatures, and then send them into battle. Best of all, with no limit to the hand size, recycled Main deck, and unlimited Energy, the Child Geeks could do this again and again and again, with only their total Life Points limiting their fun. The Child Geeks unanimously and enthusiastically agreed to approve Exodus. The Parent Geeks didn’t think much of the game whatsoever until their Child Geeks dragged them to the gaming table and made them play multiple games in a row. The Parent Geeks appreciated two aspects of Exodus immediately. First of all, it was a game their Child Geeks could teach them. Second, it was a game their Child Geeks were very eager to play with them. At a peer level, the Parent Geeks didn’t think much of Exodus and would have rejected it, but they really enjoyed playing it with their kids. The Parent Geeks also enjoyed how “family friendly” the game was, with no hint or suggestion of violence or mature images. 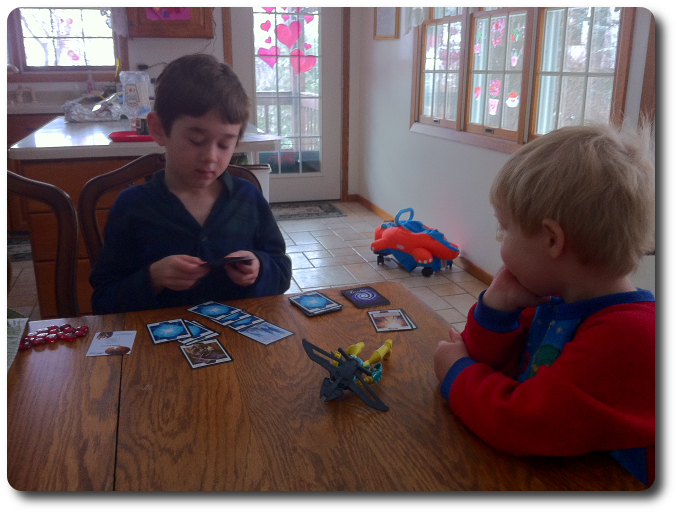 As such, the Parent Geeks agreed to approve of Exodus and thought it was a wonderful game to introduce little geeks to. Gamer Geeks played Exodus and before it was even halfway over said it bored them to tears. “Where is the variety? Where is the complexity? Where is the strategy? There’s nothing here, Cyrus! I draw cards, I play them, and they either do or do not do damage. Rinse, repeat, etc. etc. Snore!” Well, rather harsh, but pretty much on the nose if we consider that Gamer Geeks are used to games with depth and strategy that make use of tactics and complex logical thinking. All of which Exodus is in short supply of. Another Gamer Geek had a different take on it and said, “while it does not have the complexity I would look for in a trading card game, the game does have merit. If I wanted to play a trading card game with new players, this would be an excellent one to introduce them to. It has enough in it to be considered a solid base on which to grow.” Very true. Regardless, none of the Gamer Geeks thought Exodus was a game fit for a Gamer Geek’s table, but agreed it would make for a good introductory game for new players. Exodus is a stripped down and highly efficient game that has removed variables and variety in its cards to favor very straight forward and simple game play. This makes it automatically a game of little to no interest to Gamer Geeks, but for players unfamiliar with trading, collecting, or Living Card games, Exodus is going to be welcome and outstanding. It’s also the type of game that most Parent Geeks wouldn’t mind putting in front of their Child Geeks. There is nothing in the game that suggests violence or has questionable illustrations. Plus, it is really, really simple to teach and to learn. Despite its simplicity, or perhaps because of it, the game is very well-thought-out. The time and attention put into the game is apparent. As soon as you start looking at the deck of cards, which have outstanding artwork, you can see Exodus is a well oiled machine that allows players to quickly learn and play the game. The negative side of that coin is it’s not a game that has a lot of depth or strategy. More cards will allow for more options and that should open the door for more complex game play, but until then and for now, Exodus is only going to please the Child Geeks and the lucky Parent Geeks who get to play the game with them. Thanks for taking the time to read and to comment, Joel. As far as this game being created by teenagers, that isn’t important. What is important is the game, not the individual who designed it. How does the game play? What is the game like? Is it hard to learn? These are the questions we look to answer, not what the designer was thinking, how old they are, or what they had for breakfast the day before. Yes, I knew it was designed by teenagers and didn’t let that influence our review. Why should it? Exodus is a self-published trading card game. It’s small and will only grow if (1) a large publisher takes it or (2) the family who created it puts a lot more money into it. At this time, the game only has 2 pre-built decks. That doesn’t mean that’s all it will ever have. Only time will tell. Thanks for taking the time to read and to comment, Kathy. Much appreciated. Clearly you are a fan of this game, and that is super great. There is no need to jump to the game’s defense, however, as it is not being attacked. Parents and Child Geeks both liked the game. Gamer Geeks, who swim in the deep, deep waters of very complex games, did not. Our test groups told us what they thought after playing the game several times and we then report it back. I think the only opinions you are disagreeing with are those of the Gamer Geek’s. I’m sure they’d disagree with you, too, passionately. Concerning the very subjective statement “…more gamers buy Exodus the Trading Card game than anyone“, I doubt it. It’s not a “gamer’s game”. Present the sales numbers that break down the gaming background and experience levels of those who purchase Exodus that backs your claim of “truth” and I’ll eat my words. For our reviews, we play the games with Child Geeks, Parent Geeks, and Gamer Geeks. For Exodus, we played this game with different people with gaming backgrounds that range from “just starting” to “playing games for years and years and years”. We were only able to play the game with 2 people at a time because of the number of copies we were given. If the game is a totally different experience with 3 or more players, we simply cannot comment on it because we haven’t tried it. Does the game “Rock”? I don’t think so, but that’s my opinion. You clearly have your own as everyone else does. Yours is no better than mine and mine is no better than yours. We’ve published our findings and if anyone else wishes to publish a review, do let us know. We’ll be most happy to link to it so our readers can get a second opinion. Finally, send me more copies of the game, Kathy, and I’ll be most pleased to accept your challenge. My instincts tell me it’ll be just more of the same, but I’m open to it and more than happy to try the game with more than 2 players at a time. Oh, come on! Obviously the Fan Boys and Fan Girls are upset because their “precious little game” didn’t get a glowing review. Grow the [expletive removed], kids. Just because someone doesn’t like your game doesn’t mean you need to attack their credibility. That’s just weak and clearly demonstrates to everyone who has a brain that the game can’t stand on its own. I haven’t played this game and I don’t plan to. I thought Father Geek’s review did a great job of summarizing the game play and I have always appreciated how the Father Geek team looks at a game from the perspective of different age and experience groups. I “might” have thought about getting the game for my kids, but with the fan jerks coming out to defend the game’s honor, no thank you. Sounds like Father Geek got this game right, reviewed it fairly, and obviously hit a nerve. That’s really, really telling, as far as I’m concerned. And who the [expletive removed] cares if it was designed by teenagers, kids, whatever? Why should Father Geek take that into account? What are you implying? That Father Geek should turn a blind eye to a game’s shortcomings because people younger than 30 created it? That’s just [expletive removed] stupid. I agree with Father Geek’s comment that the age of a designer shouldn’t be taken into account when a game is reviewed. FURTHER MORE (now my temper is really hot), if the game designers weren’t prepared to receive critsism, then they should not have [expletive removed] sent the game out for review! I personnally think that Father Geek is sometimes too kind with their thoughts on a game, but they are always fair, always thorough, and always objective. I actually disagree with a great deal of what Father Geek has to say about games, as I want to hear about a game with a heavier hand (I’m a HUGE fan of Tom Vasel and the Dice Tower as a result), and often role my eyes at how Father Geek goes on and on about how good a game was with kids. But you know, he’s [expletive removed] right. Games are good for kids, Father Geek does all of us in the hobby a great service by reviewing games the way he does, and everyone who think otherwise really needs to read his VAST AMOUNTS OF work and get a [expletive removed] clue. Good job, Father Geek. You don’t need me to protect you, as you clearly don’t need to protect anything, but I hate it when people bash another person’s opinon when they are just stating the facts. Kind of playing a bit of a double standard in your post, Tim, but I’ll let you fight your own fights. And yes, keep the swearing down, please. While I appreciate your passion, there are better ways to engage individuals in a worthwhile and intellectual debate. I’m sure the fans of this games will respond to you, if you haven’t scared them away. Sigh…. hopefully, this game review will not turn into a war zone. Watching the drama unfold, I can see both sides of the argument. Despite the massive glowing narrative within the review of my own game, Haiku, I knew gamer geeks wouldn’t get or understand the purpose and prepared as such. But there’s the matter of picking battles. Aka, this is why I sent Fathergeek copies of Haiku and Scrapland Scramble rather than Napoleon in Egypt or Imps vs Puppies. Knowing the audience and valuing the feedback is one of the first hurdles on the career of game design. From what I’ve read on the game, you essentially have a simple template to take this farther as well as a clear roadmap of it’s strengths. You also have a clear roadmap on where it falters, as in no clear distinction between units aside from visuals. What you have is a simple system that’s easy to teach but core gamers will pass it by. I mean, no offense but it looks like everything I would want this game for, Nightfall does better and with an ocean more depth. 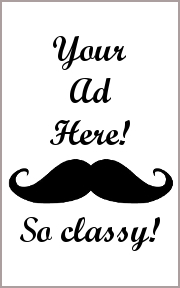 That’s fine, I’m not your target audience. So ignore me and my opinions and instead focus on the groups who do enjoy it and making it better for them. Like how about 1-2 generals who rally/boost like units based on their energy when attacking or defending? How about class based abilities or a Totem that boosts certain units attacks while in play? Think about adding more depth, not excuses, to your game. What you have is a start. It’s up to you to find this games end. Thanks for the review. Being a long term MTG player with kids this looks like a nice gateway game into that world and worthy of closer inspection. I always find Father Geek’s reviews to be the most thorough game reviews on the web. Honestly, is there any other game reviewer who puts forth the time and effort in a review like Father Geek? I don’t think so. It has been my experience that some game reviewers have become too emotionally connected to their game. Once I game is created and distributed it is up to each individual to decide its worth. Father Geek has provided his opinion of this game, and an OPINION can never be wrong. Wow… for an uncredited game that so far has no ratings, comments, photos, or even owners, and has amassed a grand total of 18 views in BGG, I would have expected a little more grateful and less pretentious reaction from the creators and their minions/parents/whatever. Father Geek is a well established and outstanding reviewer and has taken the time to play and review the game, doing a fine job showing it and articulating his opinions with all due respect. Plus the “more gamers buy Exodus The Trading Card game than anyone” statement makes me doubt about how many people have actually bought the game (other than the designer’s gaming buddies). Apparently monsters have effects if you buy boosters, they kept the starter decks restricted to simplify play. As a credit to the designers, they have a link to this review on the front page of their website. Beyond that, I can’t comment as I haven’t played the game, and I’m not sure whether I will, at some point in the future, try it or not.